Switch the Yes-No option to Yes to activate the chosen cash payment method. 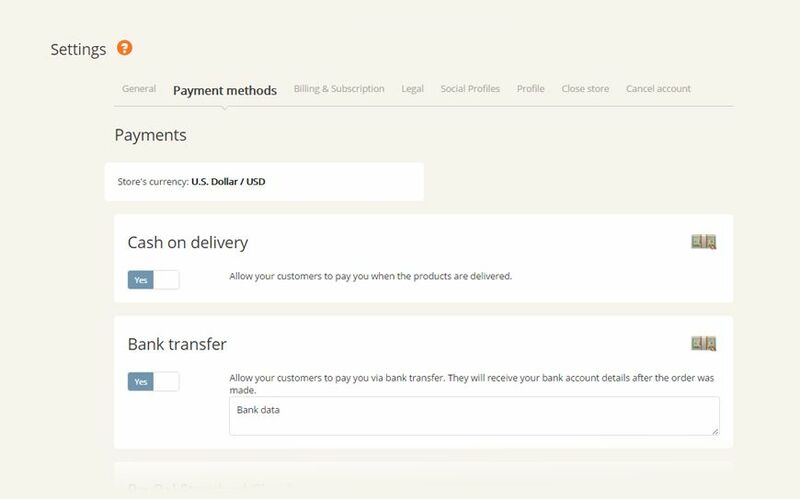 Allow your customers to pay you via bank transfer. They will receive your bank account details after the order was made. Connect your PayPal account with your Soldigo store. Switch the Yes-No option to Yes and add your PayPal account’s primary email address. Soldigo uses Payments Standard service so your customers will be redirected to PayPal’s site in order to complete their purchase. You need a valid PayPal Premier or Business account to receive payment. PayPal fees apply. In order to connect your payment gateway with your Soldigo store you need to switch the Credit Card option to Yes and choose your payment gateway. Based on the currency you set, you can choose from a set of pre-integrated payment options. Selected payment gateway fees may apply. More payment gateways will be added in the near future. Please send us the payment gateway you would want us to introduce.